It's been quite a while since I updated the blog, so I figured I'd post the results of my examination of two J-Head hot-ends that are for sale online. So, within the last 2 weeks, I purchased a Mk IV clone off of e-bay and Mk IV-B from MakerFarm. I'll talk about the e-bay clone, first. The e-bay clone arrived, straight from China, and came fully assembled with a heater cartridge. (The heater cartridge is held in by a set-screw.) The most obvious difference is that this clone has 4 cooling vents instead of the specified 5. Looking at the cooling vents it was apparent that the machining is a little rough. On my way to my machine shop, I dropped the hot-end and the PTFE liner fell out. This should not happen as it is supposed to be secured with a hollow set-screw. No hollow set-screw was installed and there are not any threads in which to install one. So, the PTFE liner will only be held in place by the extruder body. This was tried, on the J-Head Mk I, and it would result in the failure of the hot-end if the liner moved. As the PTFE liner is not projecting out of the hot-end, as per the J-Head Mk I specification, it is apparent that the liner will not stay in it's proper place. Looking more closely, at the PTFE liner, it has a smaller OD, than the liner that is specified. Also, the tapered end is roughly finished and the cold end, of the liner, looks like it was just cut off with a razor knife. However, the cold end does have an internal taper. I don't understand why this end wasn't cleaned up properly when the taper was cut. The PEEK nozzle holder has 4 cooling vents instead of the usual 5. They are bigger and deeper than the specified cooling vents. I would say that using a larger end-mill, to create these vents, is possible due to the PTFE liner having a smaller OD. (Using a larger end-mill also should reduce the machining time and cost of making this part.) The mounting groove fits nicely into an aluminum mounting plate. On the hot end, of the PEEK, there is a shoulder for the optional mounting washer. The original specification, of the root of the shoulder, is 13mm and this is 12mm. In addition, the flats to tighten the nozzle holder with a wrench are completely missing. Since I was able to loosen the PEEK nozzle holder, by hand, it wasn't very tight. The aluminum/PEEK junction is an improvement as there is no longer a taper between the two. In addition, some sort of thread sealant was applied to the aluminum threads. The aluminum nozzle/heater is made to different specifications and really has too many minor differences to mention. There are 3 major problems with it, however. The first is that the interior is based upon the original design and does not have a melt chamber section. So, the liner goes all the way to the tip. Another issue is that the nozzle orifice is supposed to be 0.50mm; however, it is closer to 0.53mm in diameter. The final issue is that the nozzle orifice length is a whopping 3mm long. I would bet that the extrusion pressure is pretty high. Do to all of the noted differences, this hot-end is more of a hybrid between a J-Head Mk I and an early J-Head Mk IV. In addition, some effort was taken to cheapen the design. The first thing I noticed about the J-Head Mk IV-B, from MakerFarm, is that the machining is very nice. After taking some measurements, it is obvious that care was taken to ensure that it is made to the J-Head specification. I only noticed two very slight differences. The first is that there is a dimple in the brass next to the thermistor. It could be for locating, work-holding, or something else. I don't know why it is there; but, it will not affect the functioning of the hot-end. The other, minor difference, is that the taper is missing on the ID on the cold end of the PTFE liner. This may cause the filament to slightly catch when it is initially threaded and will not make any difference to the normal functioning of the hot-end afterwards. The orifice measured 0.50mm and was 1.9mm long. These measurements were expected and have been proven to work fine. In summary, MakerFarm sells a very impressive J-Head Mk IV-B. I was a bit disappointed with a J-Head clone I recently purchased, A mistake I won't be making again. 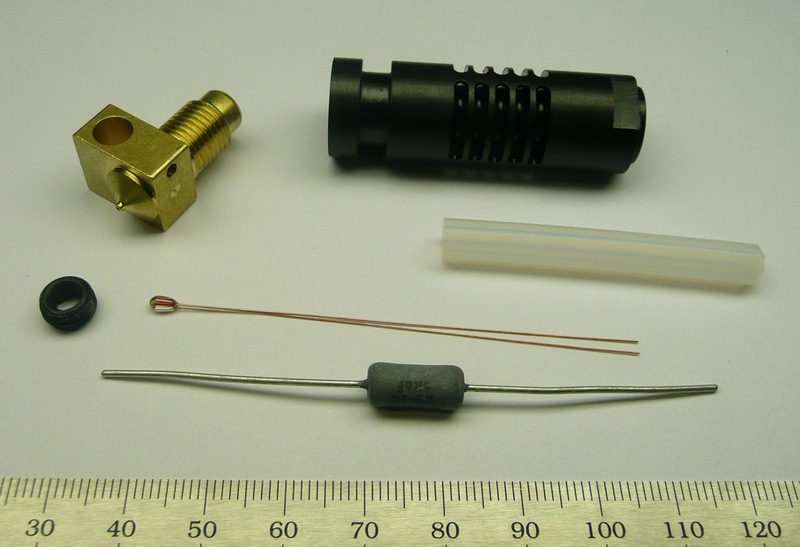 The 1.75mm hot-end is quite reliable and it is guaranteed to work under normal conditions. Your clone review was very nicely done. You might want to know that on a Dutch site a hot-end is sold under the name J-head (although it doesn't look like one). Unfortunately, the Chinese are now calling almost any hot-end a J-Head. E-bay is contaminated with them.